The bony struts reinforcing thin plates of bone show it’s from something that lives in water all the time and which lacks lungs – you can tell this because this structure is what you get when you’re dealing with forces moving in a variety of directions, rather than mainly dealing with the constant force of gravity or compensating for buoyancy that is unavoidable when you live in water, but have lungs. 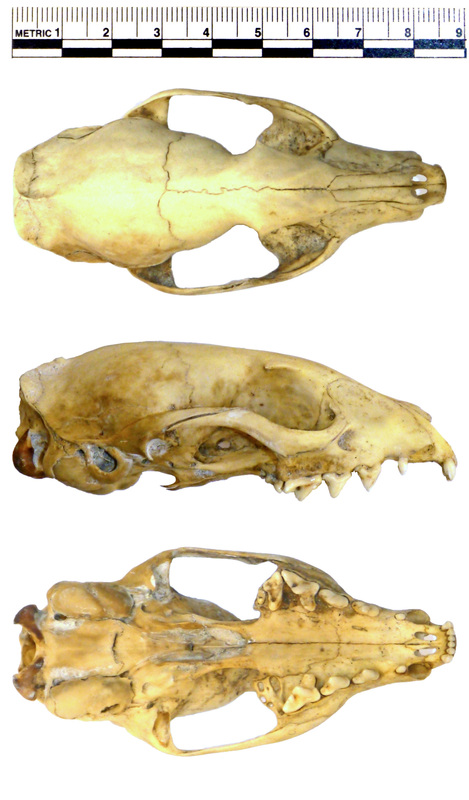 The first image is the skull roof, showing the elongated frontals and parietals (front of snout is left in first three images). Second image is a left lateral view, showing the internal parasphenoid that would pass between the two eye sockets. Third image is a ventral view, showing the bottom of the parasphenoid. And obviously last image is posterior view, showing the foramen magnum where the spinal cord would pass through, over the occipital condyle. It just may not look like a skull to some because it’s missing the eye sclera bones, jaws, cheek bones, pretty much anything that is not the skull roof or braincase. However, as we all know, there are a LOT of different sorts of fish – around 33,600 described species and counting. This can make fish a nightmare to identify. However, there are some great resources out there, like Osteobase which has a very useful identification guide for various elements of a range of fish. Alas, Osteobase didn’t have anything that fits this mystery specimen, so narrowing down to a species is rather difficult. I had the advantage of knowing that the specimen was collected in Baja California, although that was of little help in trying to get in an approximate area of the fishy family tree based on morphology, and there are still a ridiculous number of fish species is the area. Sarah Gibson suggested that it may be a Barracuda, and it certainly fits in many aspects, but the shape of the frontals and parietals and details of the point of connection between the parasphenoid (that’s the bottom bar bit you see in the side view) don’t quite fit. I had almost given up hope, when it occurred to me to concentrate on understanding the unusually large occipital condyle that Allen Hazen noticed, which suggested that it might be a taxon with an extremely extended rostrum (like the paddlefish or swordfish that Jennifer Macaire suggested) but with a weedier body and defined neck region since there would be no need for such a large articulation in a fusiform fish (they’re the muscular type that taper at both ends and have no neck, so don’t move their heads). With this bizarre sounding fish in mind I was able to fairly rapidly narrow down the possibilities to one of the three species of cornetfish that live in the Pacific. I was delighted to find some great images of the skull of a Red Cornetfish, which matches the morphology very well. However, the Red Cornetfish doesn’t really occur in the eastern Pacific, so it’s very unlikely to be that species. The Reef Cornetfish does occur in the eastern Pacific, but has only been reported in Californian coastal waters since November 2015 and this mystery specimen was collected back in January 2000 (which doesn’t make it impossible to be a Reef Cornetfish, just very unlikely). Which leaves us with the most likely identification (although by no means confirmed) of Deepwater Cornetfish Fistularia corneta Gilbert & Starks, 1904. These long, thin fish can reach up to 2m, but they have tiny mouths that limit them to eating crustaceans, marine worms and smaller fish that they pick up from near the surface of reefs and the sea bed – presumably being harder to spot as a predator thanks to their very small frontal projected area. I’ve asked Joe to check his specimen against the images of the cornetfish, since there’s nothing better than having a specimen in your hand when attempting an identification. I hope you enjoyed the challenge! I didn’t mention that top of the cranium had been removed, probably as part of a postmortem, which is quite common for zoo specimens. Of course, this made the identification a bit more tricky. That absent skullcap led to several suggestions of Tasmanian Devil, since they do have a very similar looking facial region to this specimen, with a short and blunt muzzle, robust zygomatic arch and even the same toothcount in the upper jaw. However, the Devils have an angular process of the mandible that projects medially (towards the midline) rather than backwards in a hook, so you wouldn’t see it in a side view. Which hints at “Red” and “Pandarus” giving us the Red Panda Ailurus fulgens F. Cuvier, 1825. These charismatic critters are another example of an arboreal carnivore that is adapted to feed on a highly vegetarian diet, but unlike the previous mystery object (a Kinkajou) these cuddlesome floofballs eat mainly bamboo rather than fruit – rather like their very distant relative the Giant Panda (despite the similarity in diet and common name, the Red Panda is actually more closely related to the Kinkajou than it is the Giant Panda). Red Pandas are a bit less highly specialised for feeding on bamboo than the Giant Pandas, probably because they have a more varied diet that also includes fruit, eggs, birds and small mammals. The poor nutritional quality of bamboo does mean that they spend a lot of time sleeping and they tend to move fairly slowly in order to conserve energy, although they can be very playful, especially in captivity where they can access higher quality foods. Sadly, this playfulness and supreme floofyness is a bit of a problem for the wild Red Panda population. There is demand for wild caught Red Pandas in the pet trade and they are hunted for their thick fur right across their range through the foothills of the Himalayas, despite being protected by legislation in every country. This may be a bit easy for some of you (although if like me you were up late last night to watch the election that may not be the case), so cryptic suggestions are encouraged. I don’t normally add a photo of the tail, but in this case it should make the identification a doddle – literally a 50:50 shot at getting the right species. If you know what I’m talking about, then please be cryptic in your suggestions – don’t spoil it for everyone else! If you don’t know why this tail is so significant then you should know that the skull is 10cm long and all will be revealed next Friday!